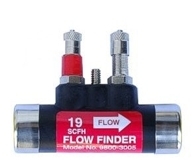 The Flow Finder System of Measurement represents an innovative way of obtaining accurate air flow readings in a cable pressurization system. Originally comprised of a portable Flow Gauge and the four Flow Finders shown here, the Flow Finder System of Measurement has evolved into a full line of reliable, easy to use hardware products. Flow Finder technology is at the heart of our High Resolution Transducers, central office panels, bracketed manifold assemblies and other field hardware. 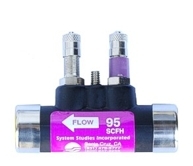 It is based upon the use of a calibrated orifice which, when placed in the air flow stream, creates a minute but measurable pressure differential that is converted into an accurate air flow reading by the measurement device (Flow Gauge or High Resolution Transducer). Please note that two additional Flow Finders are available for one inch air pipe systems: Part No. 9800-3190 (0190 SCFH) and Part No. 9800-3098 (0950 SCFH). Both of these models share the same dimensions and general specifications as the Part No. 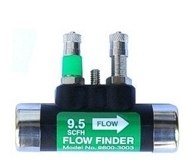 9800-3097 Flow Finder. 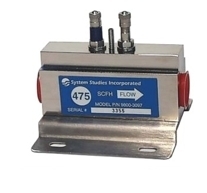 Please refer to our product data sheet for additional information about the Flow Finders. Pricing information can be obtained from your Purchasing Department or by calling System Studies Incorporated at 800-247-8255.